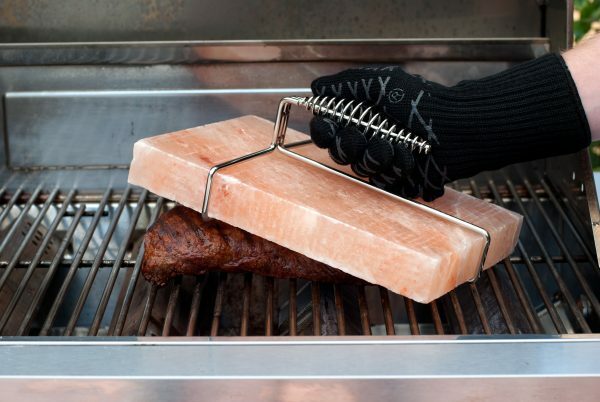 The Himalayan Salt Plate Press is a brick of Himalayan salt designed as a press for cooking various meats on the grill. This unique product is similar to the traditional cast iron meat press that is commonly used to press foods to the grill during cooking. Yet, the weight and flavors of the Himalayan salt block add new benefits to this style of cooking. Traditionally, pressed cooking comes from dishes like Pollo al Mattone or chicken under a brick. These dishes used bricks as weights to be placed on top of the chicken as it cooked to press the full piece of meat to the grill. This action of pressing makes the meat cook with more surface area in contact with the grill top. The result is faster cook times and a crispier outer layer to the meat. The Himalayan Salt Press harnesses these same benefits of increased surface area and caramelization by mimicking the weight of a brick. The salt press can be placed on a piece of meat and has enough weight to impart adequate pressure to achieve grill marks. The process is made easier with the salt presses detachable handle which firmly grasps the salt brick for easy maneuvering. Like other Himalayan Salt Plate Cooking, as the meat is pressed the Himalayan salt adds the bonus of continuously infusing salt into the outer layer of the meat. This gives the meat an added burst of flavor while obtaining the traditional brick pressed benefits. Together this new salt press is able to create a crispy caramelized and salty coating to the outer layer the cooked meat. Resulting in a crispy on the outside, juicy on the inside grilled piece of meat. Similar to the Salt Plate Press, Charcoal Companion has a variety of other salt plates for cooking on the grill. The Himalayan Salt Plate and holder set for example is another very popular salt infusion tool. The full plate is rich in trace minerals and has a naturally high moisture content, which allows the plate to be heated or chilled to extreme temperatures. The Himalayan Salt Plate works wonderfully on the grill, on a gas range or even chilled in the refrigerator for beautifully presenting cold food.